Tomasina Miers (victorious maiden chef-ess of Masterchef several years hence) has several very successful outposts of her Mexican streetfood restaurant under her belt, spanning Canary Wharf, Covent Garden, Westfield and now Soho. 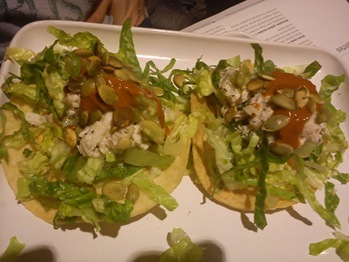 I had been a devotee of the first branch when it opened in the restaurant wasteland that is Covent Garden a few years back and was excited by her zingy, fresh Mexican food that actually tasted Mexican, as opposed to flabby Euro-Tex Mex. But then I became super-irked when the restaurant became so popular that you had to actually QUEUE to leave your mobile phone number so that the maitre’d could call you on the off chance that a table became available. SO infuriating. 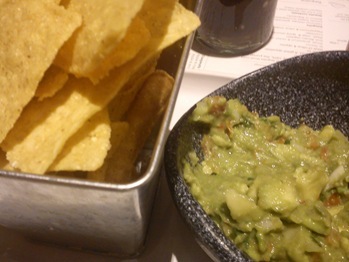 Many, many harrumphing snorts of indignation and aborted trips to Wahaca. For the past two years or so, I had been in a ‘can’t be arsed’ huff with the place. I couldn’t take the rejection anymore! But then quite by accident I stumbled upon the newest Soho branch a couple of nights ago, when out with my husband and mother-in-law. We approached the place with a fair bit of trepidation, because I really, really couldn’t be arsed with a long queue again – when I don’t eat I become absolutely vile-tempered and irrational like a child. But we walked in and a very friendly chap seated us straight away. I was almost in shock. The acid bright walls and Mexican kitsch gladdened our souls on a gloomy, rainy November evening, and as soon as an array of chilli sauces and tortilla chips was plonked down in front of me, I felt all was right with the world. And the food spoke for itself – all crisp, zingy and fresh flavours. 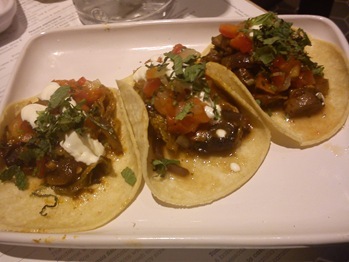 Flavourful, aromatic Mexican grub served with flair and unpretentiousness. Lots of lovely smoky chipotle in everything. Great value, too. The restaurant has some great design touches – I coveted the hexagonal turquoise mosaic tiles in the toilets, the massive Jesus/Mary printed metal chain curtains hanging up in the stairwells (lush!) and the general riot of clashing bright colours on the walls. Lovely chunky recycled glassware, too. Instead of books of matches, they give away match books of chilli seeds. Brilliant. So…my advice is get there quick, before the restaurant becomes too popular again – give it a month or so and the queues will be out the door and you’ll have to get your elbows out! 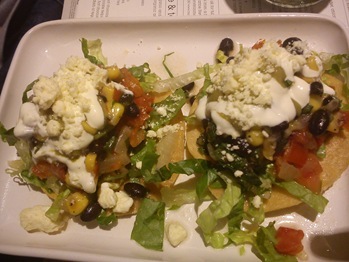 There is a great burito bar called Benito's Hat in Covent Garden, and they have a sister restaurant in Goode Street. Mega-yum, if you're in the area. 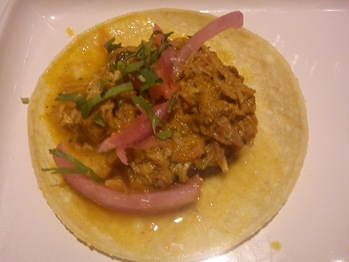 There's also a super-cute burrito place called Picante that's just opened up in Westminster: http://www.picantemexicangrill.co.uk/Really delicious burritos, quesadillas and tacos. Anne, I work in the heart of everything foodie it seems. I have recently discovered Paul's bakery café and oh my WORD…. 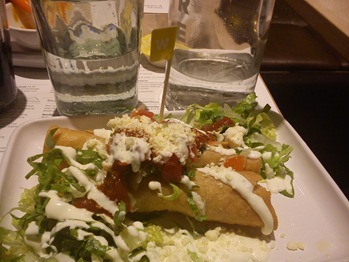 Wahaca was one of my favourite restaurants in Covent Garden until it became impossible to get a table at any time of the day. I'll certainly be popping past the Soho incarnation to see if I can get my mexican streetfood fix without a wait.